The incident came about when Stephen Curry’s sister, Sydel Curry, sent out a Tweet. Sydel, who is a junior at Elon University and a member of their volleyball team, noted that she, along with her mum and grandmother, were on their way to Cleveland for Game 4. Wheels up to Cleveland w. Mama and Granny ???? 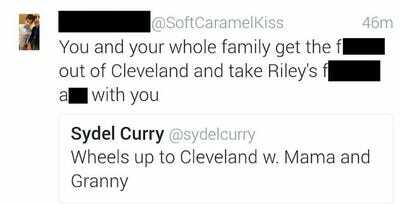 One Cavs fan replied to that tweet with a NSFW message that not only was directed at Sydel, but also Stephen’s daughter, Riley. “You and your whole family get the f*** out of Cleveland and take Riley’s f****** a** with you,” the tweet said. Sydel initially replied with an innocent comment, “We’ll be gone Friday! Bless up.” However, after that, Sydel directed some more forceful comments to the fan, clearly upset that he had also gone after 3-year-old Riley. “Our apologies to all who were a party to this attack. Holton Wise does not condone this & we have terminated this apprentice,” their message on Twitter said. On behalf of the entire Holton Wise team, I would like to sincerely apologise to the Curry family and anyone else who was offended by the actions displayed yesterday on Twitter, by a former Holton Wise team member. Once we were made aware of his wildly inappropriate behaviour we immediately terminated this individual as those actions are not reflective of the culture here at The Holton-Wise Property Group. We do not condone or tolerate hate speech of any kind, let alone hate speech that is directed towards a child. This is once again a reminder that it doesn’t matter how many followers you have on social media, it just takes one to see a tweet and it will soon be seen by millions. It is also a reminder that while a person in the U.S. has the freedom to say what they want and they are free to not be arrested for those words, that doesn’t mean they are free from potential consequences for saying hateful things.